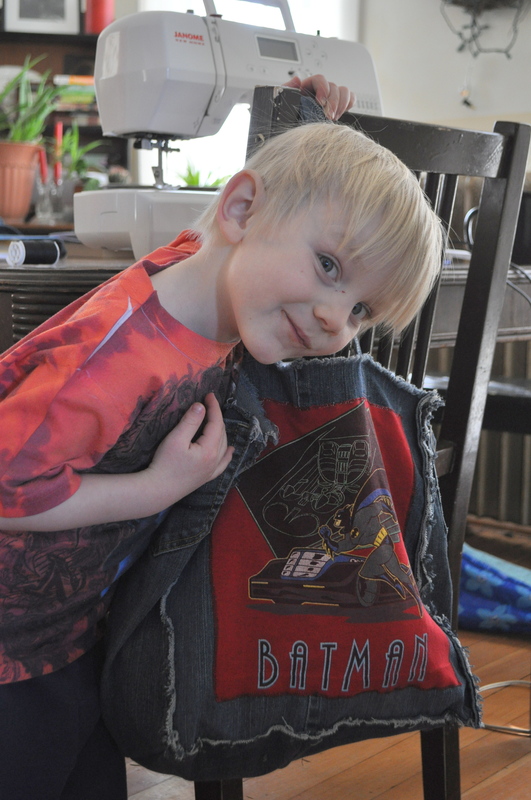 I can be a little sentimental about the clothes my kids have outgrown. We are moving this summer and my husband has challenged me to turn all those clothes I’ve saved into something crafty. When I realized last week that my littlest needed a new bag to carry back and forth to pre-school, I headed for the To Be Upcycled pile and the kids’ clothes stash for some supplies. 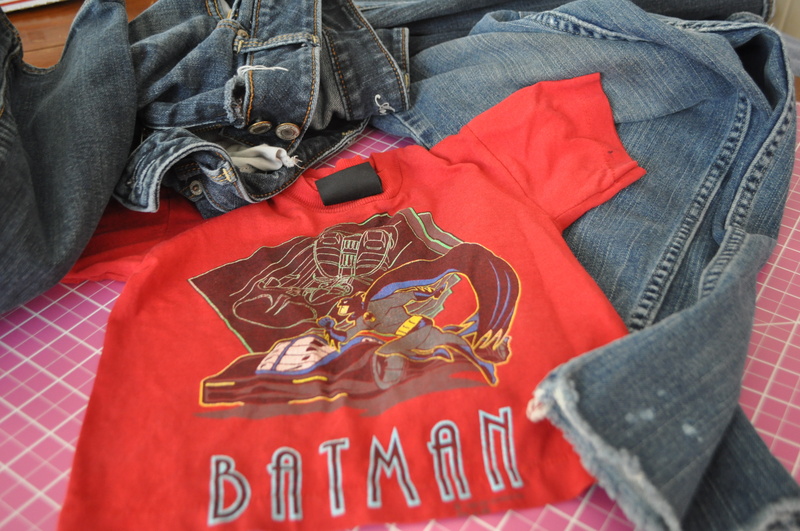 Supplies: One size 2 Batman shirt and 2 pairs of jeans my teenage girls wore to death. The bag he had been using was just your basic reusable grocery bag, the kind they sell you at the checkout for 99 cents (there’s a reason they’re only 99 cents usually. Those seams do not hold up with everyday use). It was the perfect size for his blanket, snowpants,sneakers, and what have you .So, I just copied the bag exactly for my pattern. The bottom part of the pantlegs from one pair of jeans became the front & back panels for the bag.I spit the seams on one side to open it up larger, then cut each cut pantleg into about 12 x 13 pieces. I cut the Batman design from the t-shirt and appliqued it to one of those panels. There was more than enough material from one pair of jeans for the straps and after all that jean-cutting, I ended up with a pair of perfectly good jorts! Although I doubt anyone in our house will wear them as jorts , so I’ll just add them back to my recycling pile. 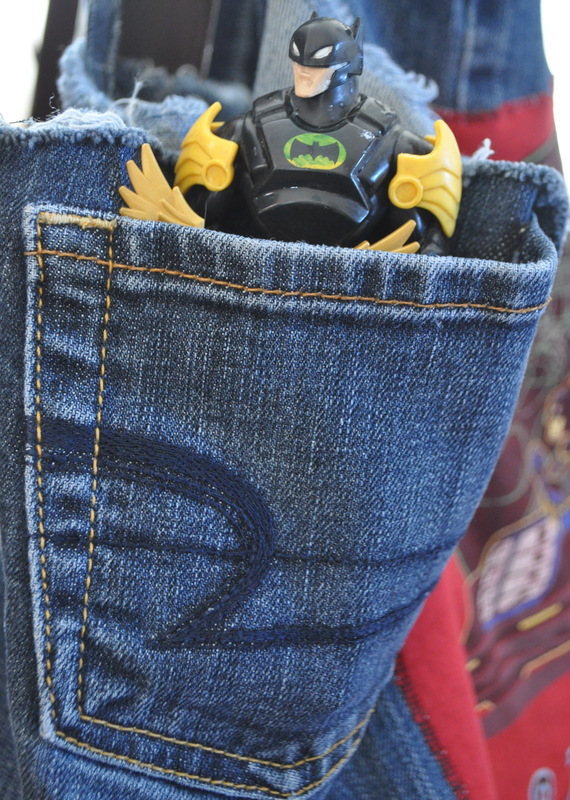 I went with sewing the seams on the outside for that frayed denim look but I’m honestly not sure how I feel about it. Household opinion was 50/50 on it. But the little guy loves it, so that’s what matters. I noticed that the Batman applique isn’t centered but I’m ok with that. I find that when I’m sewing for myself or kids, I’m a lot more forgiving and a bit messy. If that was something I made to be sold, I’d probably pronounce it ruined and want to set fire to it. 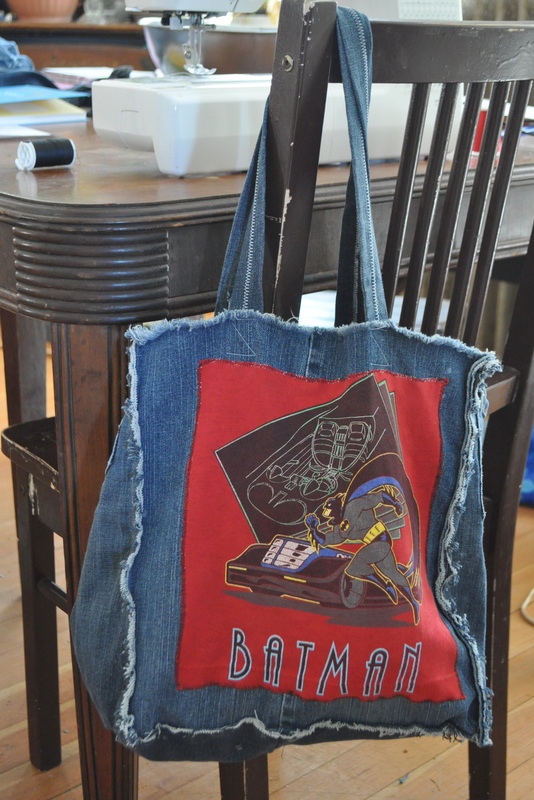 This entry was posted in Green Living, Recycle Crafts and tagged bags, batman, family, recycling, sewing, sustainable living, upcycling. Bookmark the permalink. That ingenious ! My grandson would be happy to carry a bag like that ! Well done !